Bath bombs leave your bathwater cleansing, soothing and delightfully fizzy. However, boutique bath bombs can be expensive and include a fizzing ingredient called citric acid that can be harsh on your skin. It's easy to make on your own using ingredients found at the grocery store, and you can omit the citric acid. This recipe calls for cream of tartar, which, when combined with baking soda, will give you the same fizzy results. This recipe yields eight large 2-by-2-inch bath bombs when using the large silicone ice cube mold. However, any type of mold will work. Regular ice cube trays, muffin tins or even rounding the bath bombs with your hands will make beautiful shapes. 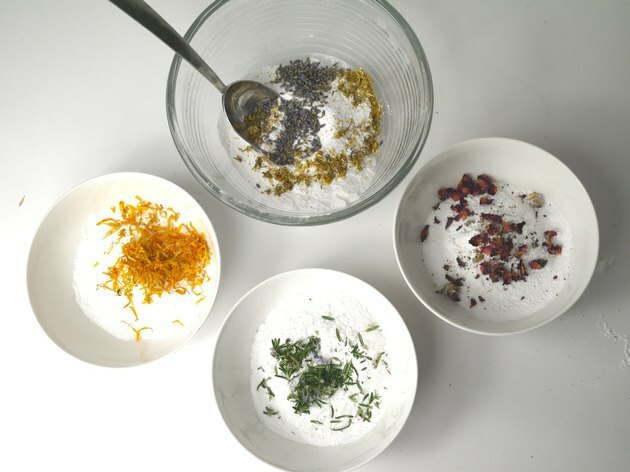 The recipes makes four different types of bath bombs: Lavender Chamomile, Calendula Orange, Rosemary Peppermint and Rose. If these scents don't appeal to you, get creative with your own recipes. 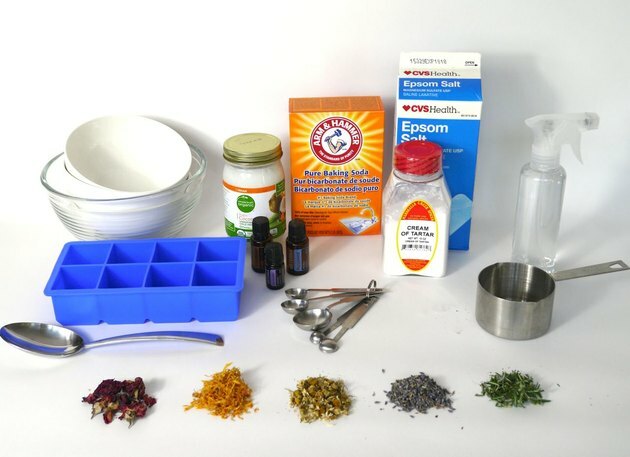 All you need to do is add different essential oils and omit the flowers. You can also include food coloring to tint them a different color. 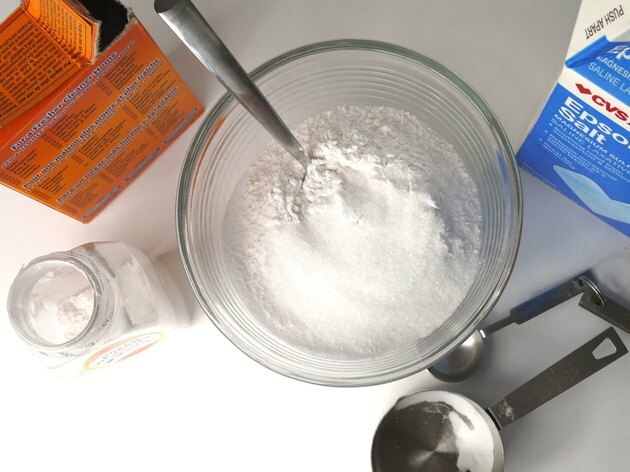 Combine the baking soda, cream of tartar and Epsom salt in a mixing bowl and mix thoroughly. Once the dry ingredients are throughly mixed, separate them equally into four mixing bowls. Each bowl should contain slightly more than 3/4 cup. 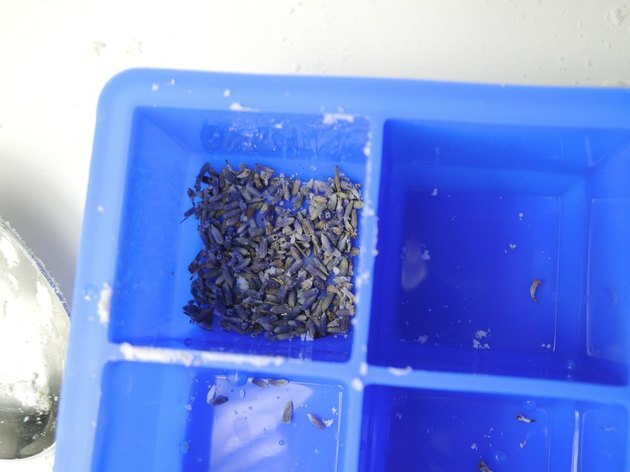 If you want to make one large batch of a single scent, skip this step. Mix a single recipe in each of the four bowls. Or, if making one large batch of a particular scent, simply quadruple the recipe in a single bowl. Lavender Chamomile for a calming bath. Combine 1 tablespoon dried lavender, 1 tablespoon dried chamomile, 20 drops of lavender essential oil and 2 teaspoons of coconut or olive oil. Calendula Orange for a healing bath. Good mix for light rashes or rough skin. Combine 1 tablespoon dried calendula flowers with 15 drops of calendula essential oil, 10 drops of wild orange essential oil and 2 teaspoons of coconut or olive oil. Rosemary Peppermint for a clearing bath. Good for clearing clogged sinuses and soothing tight muscles. 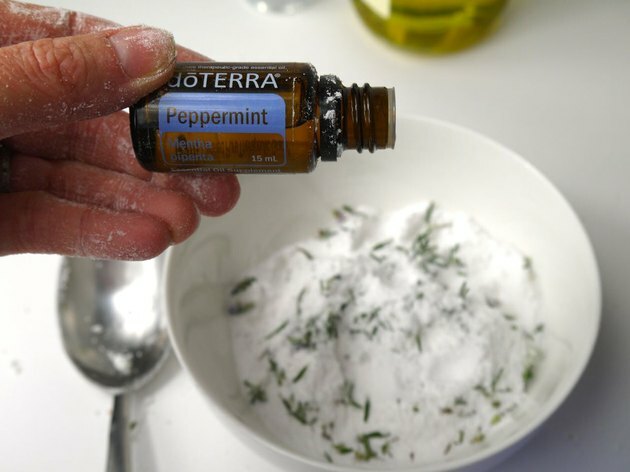 Combine 1 tablespoon dried or fresh rosemary leaves, 15 drops peppermint essential oil and 2 teaspoons coconut or olive oil. Sweet Rose for a conditioning bath. Rose oil conditions the skin and will leave you feeling silky smooth and smelling sweet. Combine 1 tablespoon dried rose petals, 20 drops rose essential oil and 2 teaspoons coconut or olive oil. Remember, whatever you put in your mixture will end up in your bath and down the drain. Keep twigs and leaves out of the mixture, and crush large petals when necessary. You can also place the finished bomb in a cheesecloth pouch before placing it in the bath to contain the flowers, or simply omit them all together. 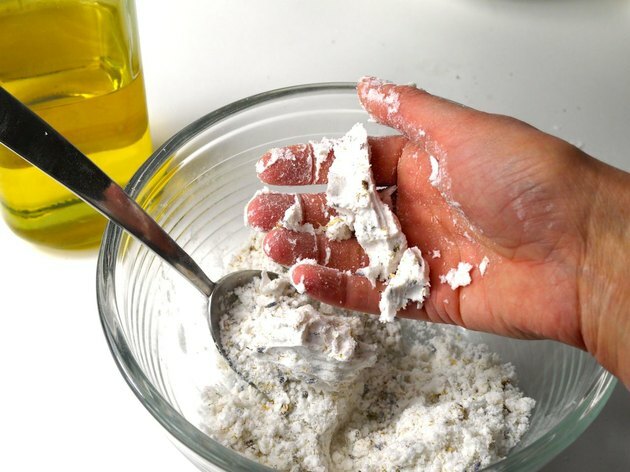 Once all the ingredients are throughly combined, test the mixture by squeezing a small amount in your hand. 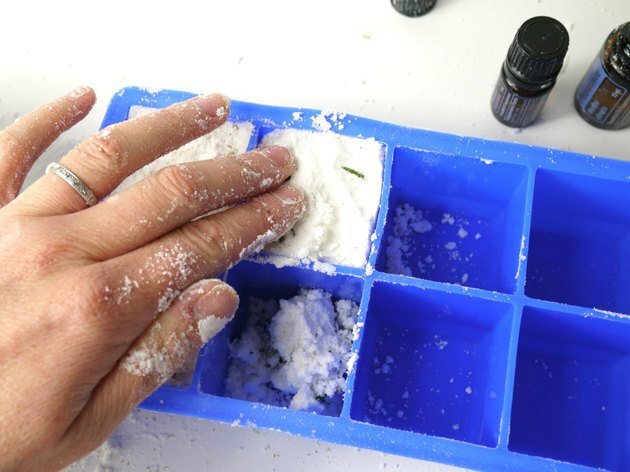 If the powder easily compresses together without separating, it is ready to place in the molds. 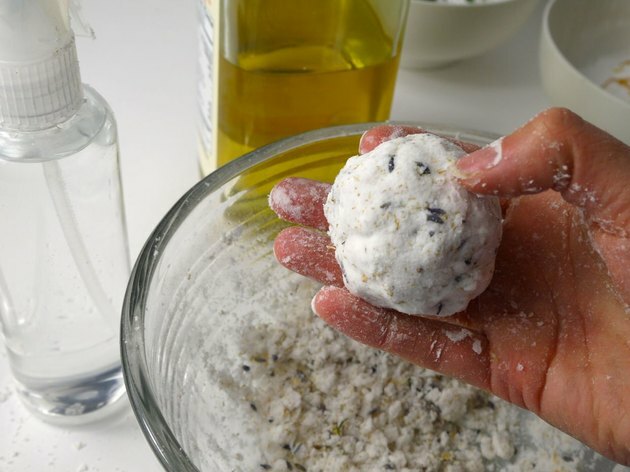 However, if the mixture crumbles apart, add a single spray of water at a time until you can compress it into a ball. You shouldn't have to add more than five sprays of water. Now pack the mixture tightly into the silicone molds. 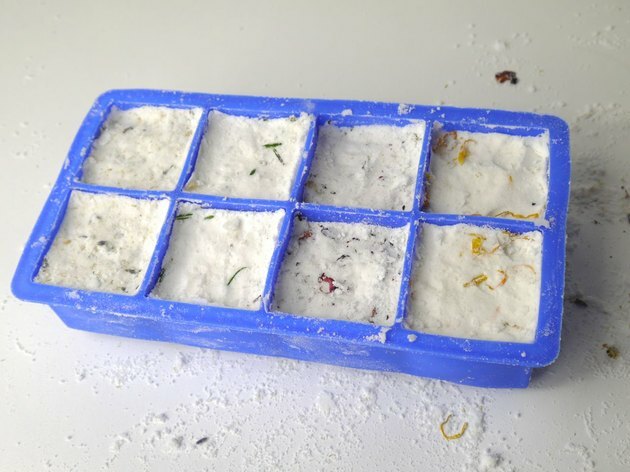 Each one of the four mixtures will fill two cubes perfectly, filling a total of eight cubes. You can add dried flowers in the molds before you add the baking soda mixture to give the bombs a flowery decorative top. 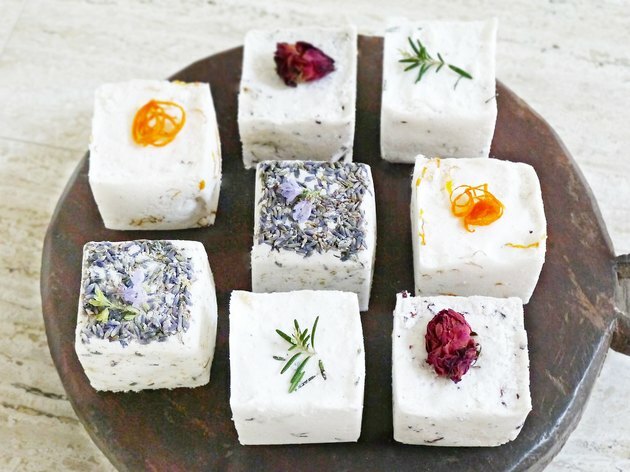 This technique is great if you are giving the bath bombs as a gift. 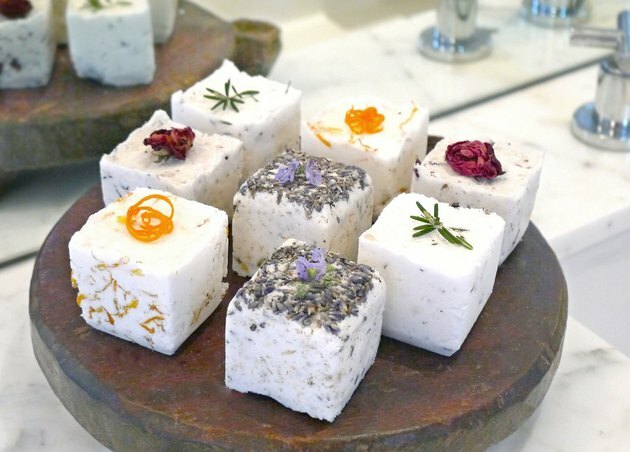 Or, you can garnish the finished bombs with a sprig of rosemary, orange peel or a dried rosebud. Leave the mixture in the mold for 24 hours to dry. Once the bath bombs have dried for 24 hours in the mold, carefully remove them and allow them to air dry undisturbed for another 24 hours. Then, drop one in your bath and enjoy the fizz!